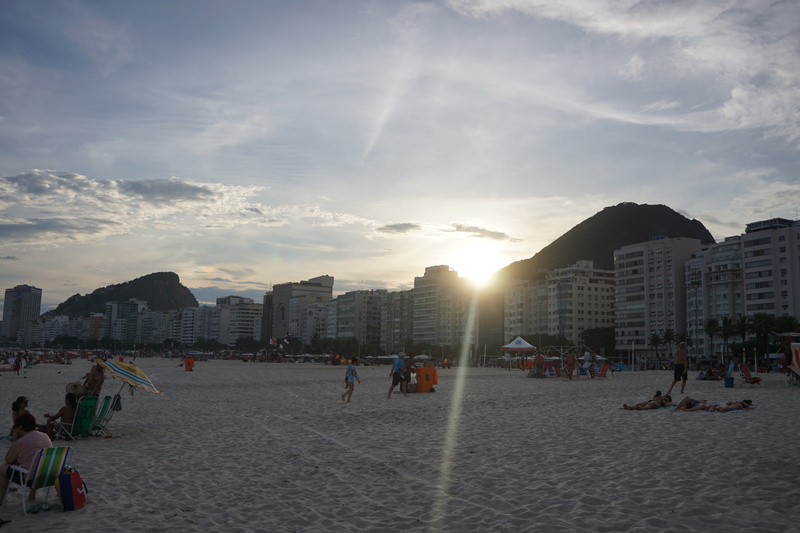 Earlier this year, I traveled to Copacabana beach in Rio de Janeiro, Brazil for a vacation over a long weekend. What a trip! The city and the beach are both beautiful and there is plenty of half-day excursions for folks who do not want to lay by the beach the entire day (although there is certainly nothing wrong with that). Round-trip flights into GIG were under $540 from Washington DC. What makes this flight even more desirable is that it was a red-eye flight that departed after work on a Thursday (or any day of the week) and arrived at a reasonable time the next morning. 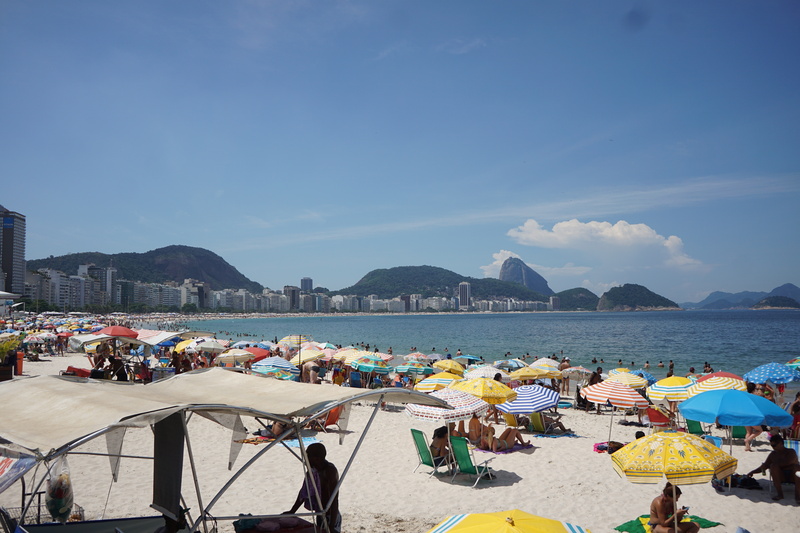 Copacabana beach. The lines in the sand are soaker hoses (the sand was pretty hot) that would lead you to little vendor tents that were selling beer, water, and beach towels. I cleared customs and immigration fairly quickly because I secured my visa in advance (what a process, but that’s a story for another time). I was traveling with only a backpack so I did not have to go through the x-ray scanner line upon entering the country. When I exited the secure area, I found the currency exchange booth where I learned two important lessons. First, you should coordinate with your local bank to order currency prior to your trip. I hear that you receive better exchange rates when you request the currency in advance. Second, I was so shocked by the poor exchange rates that I wandered around the airport looking for another currency exchange booth. There is an identical booth outside of the departures area that, not surprisingly, offers a better USD to Brazilian Real exchange rate. I exchanged my currency there for a better non-favorable exchange rate. I opted to take a taxi from GIG to Cristo Redentor (Christ the Redeemer) which cost around $15 for the 45 minute drive. This was the best taxi driver (or driver for that matter) that I’ve ever witnessed wield a car. This guy was focused, determined, and skilled. We sailed through small gaps on a crowded street and eeked in at the last minute to avoid long lines. In addition, the views of the city from the expressway were pretty cool. There are a lot of small houses built up the side of the hill. You should click on the photo to see it in full resolution. It is hard to see, but there are large blue trash bins on every roof. This was the first taxi ride that I’ve taken where I voluntarily tipped the driver (tipping is usually not required in Brazil). Money well spent. 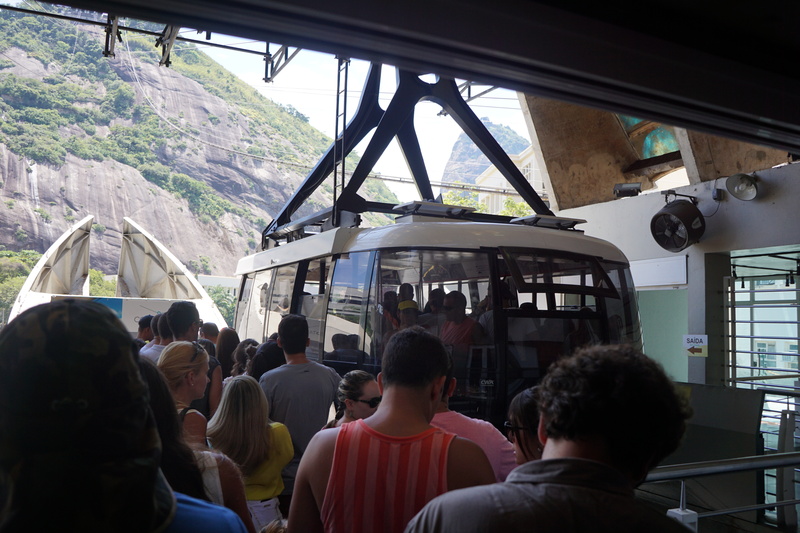 There are two main options for reaching the top of Cristo Redentor, which sits at the top of a fairly tall and steep mountain. First, you can take the train (pictured below) which is relatively cheap and offers great views of the city on the way up. Second, you can take private vans which are more expensive and only take you halfway up the hill. I planned on taking the train, but it was broken when I was ready to board. You can see the stranded train below. Needless to say, I opted for the private vans. I thought the price was reasonable until I realized that the van dropped me off halfway up the hill, where you were forced to pay for a second van company to drive you the rest of the way up the mountain. The line was quite long for this second van company–about 30 minutes long. I lucked out though as there were two United pilots who flew a Boeing 787 down from Houston, Texas standing in front of me in line. They were scheduled to fly back the next day and were sightseeing during their layover. 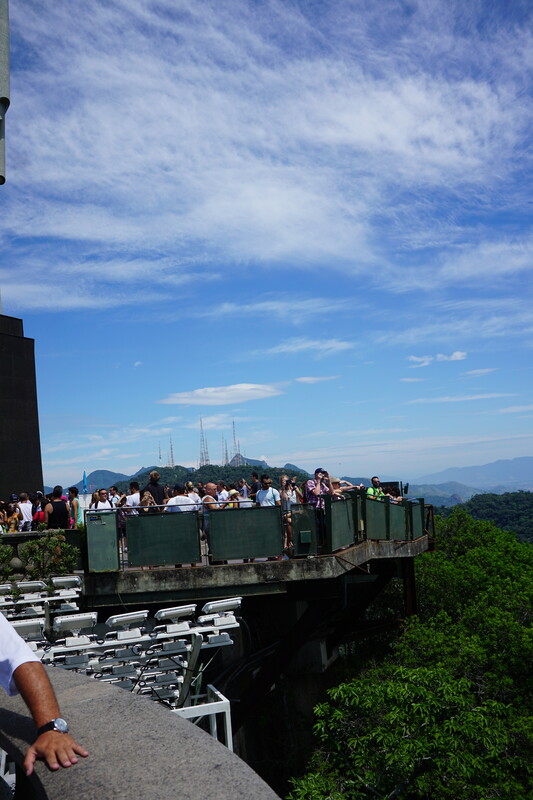 Once your van reaches the top of the mountain, you climb a steep staircase that bring you up the backside of the viewing platform (pictured above). 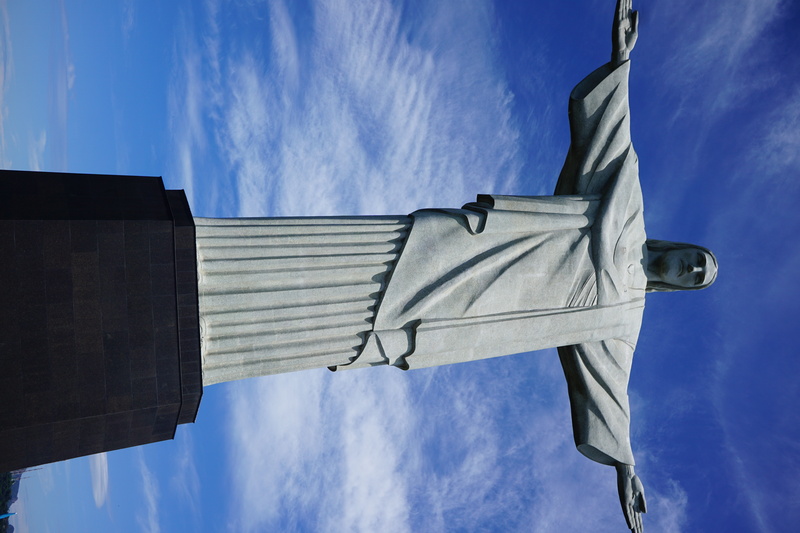 When you reach the top, you are on a viewing platform that surrounds Cristo Redentor and offers amazing views of the city and beach. The platform was quite crowded and everyone there wanted a selfie with the big guy. Since I did not want to fight the selfie crowd, this was the best picture that I could secure. The statute is huge–this photo does not do it justice. 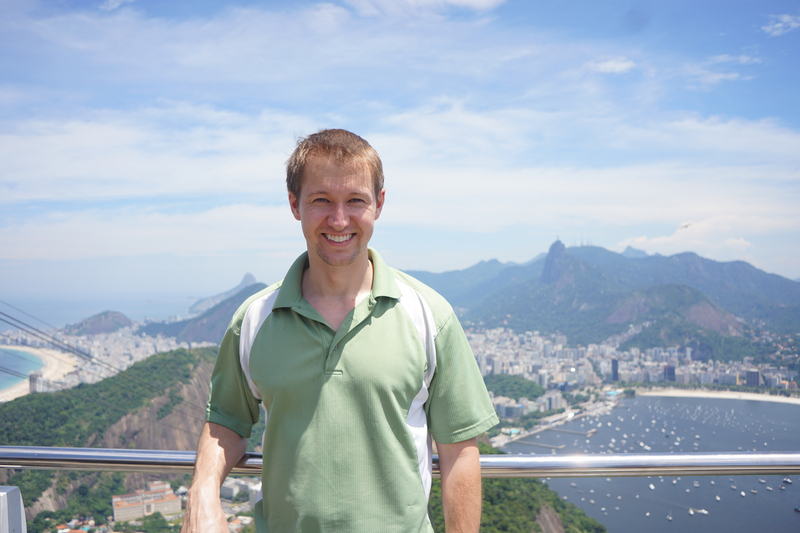 The views from the top were breathtaking and revealed the mountains that surround Rio de Janeiro. 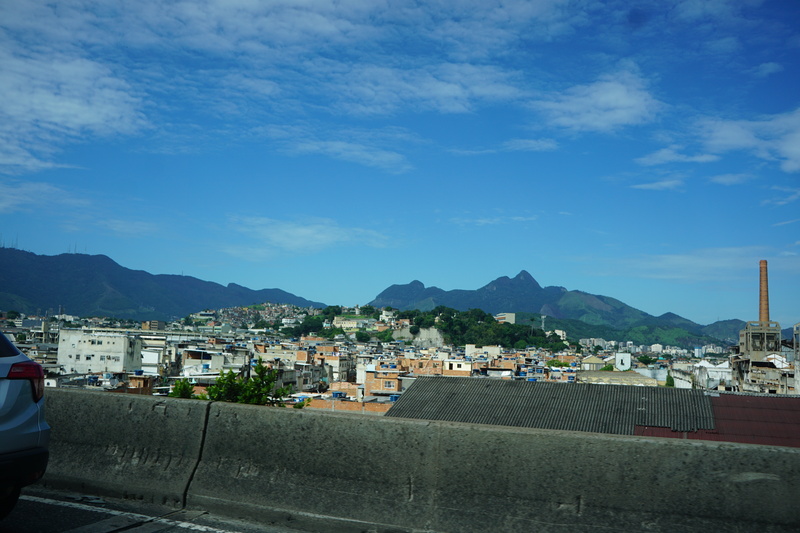 This panorama shows the city to the north of Cristo Redentor as well as GIG. You can click on the picture for a full-resolution image. This panorama shows the city to the south of Cristo Redentor as well as Leblon Beach. You can click on the picture for a full-resolution image. The trip back down tot he bottom of the mountain was just as arduous as the trip to the top. Two bus rides and about 35 minutes of waiting in lines/ driving. 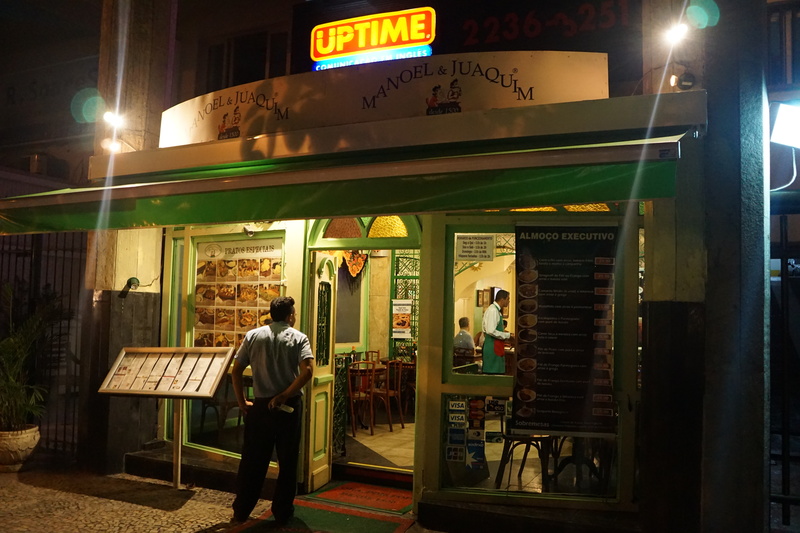 It was another 15 minute taxi ride to Copacabana. 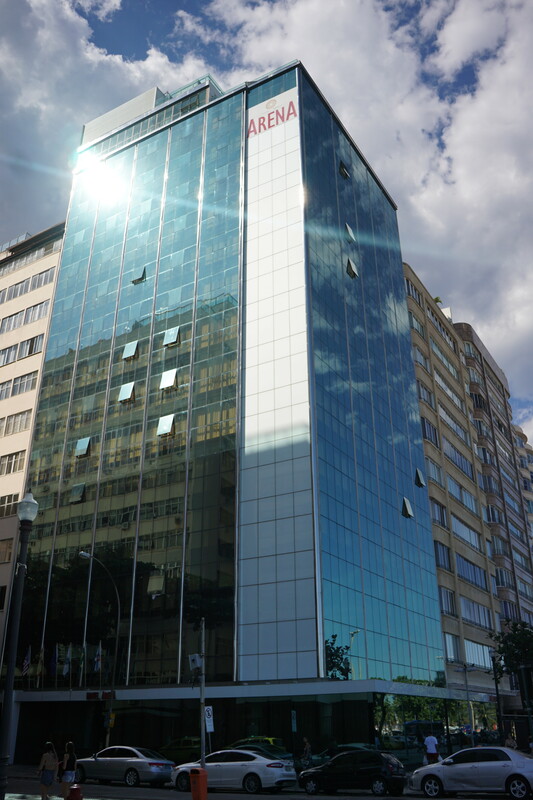 I stayed at the Arena on Copacabana which will be reviewed in a separate post, but it was a great hotel. I was a little early for check-in but they were still able to accommodate me. I dropped of my stuff and headed to the beach. The beach itself was fairly crowded but that is to be expected for one of the most famous beaches in the world. The sand and water looked amazing. 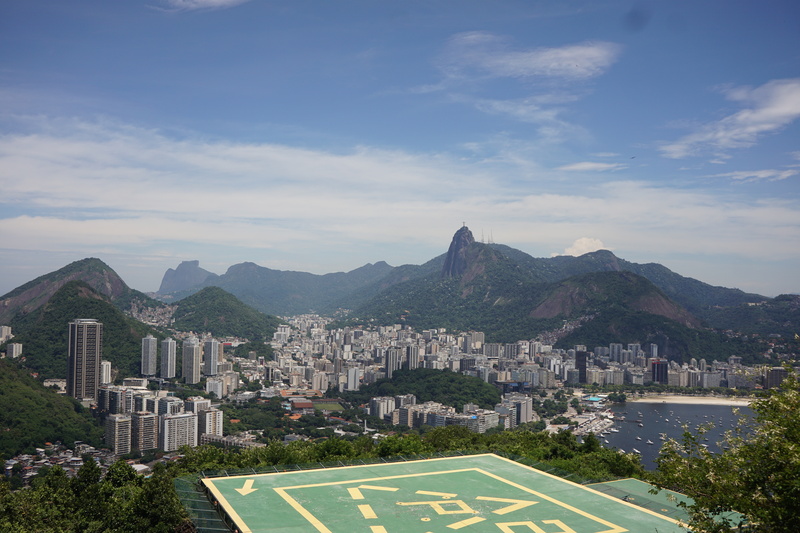 The picture below shows about 75% of Copacabana and Sugarloaf Mountain. 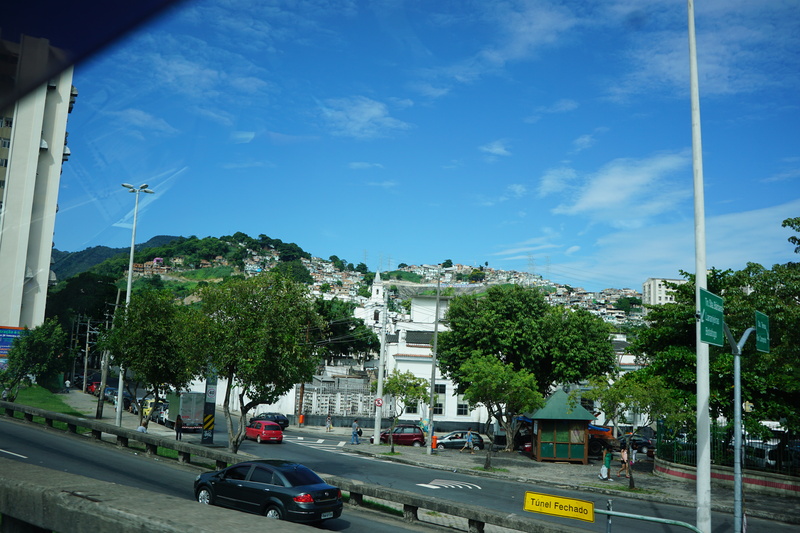 This picture faces West and shows about 50% of Copacabana. Copacabana Fort is barely visible on the left. 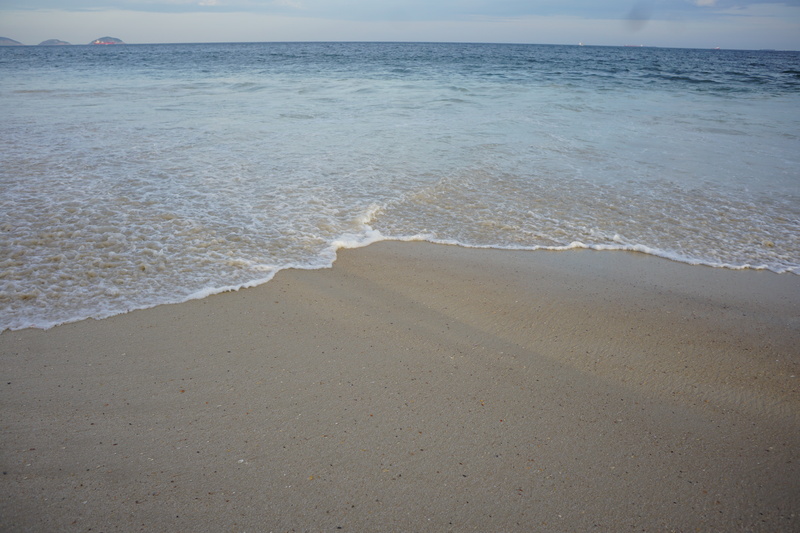 It wasn’t until sunset that I was able to see ten feet of beach without any people. At sunset, the beach hosts several competitive and highly-skilled games of sand soccer. 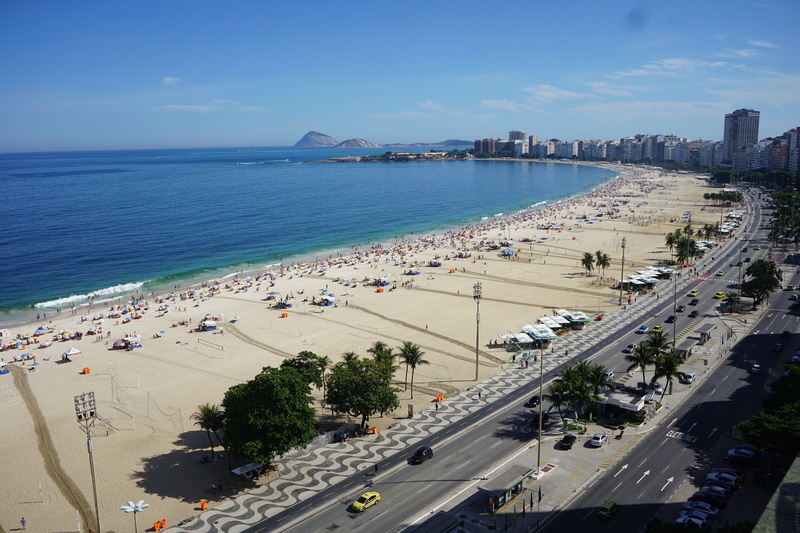 Leblon Beach is located to the West of Copacabana and looks almost identical. It was equally crowded but the water was clearer and the beach features several higher end hotels, including the new JW Marriott. 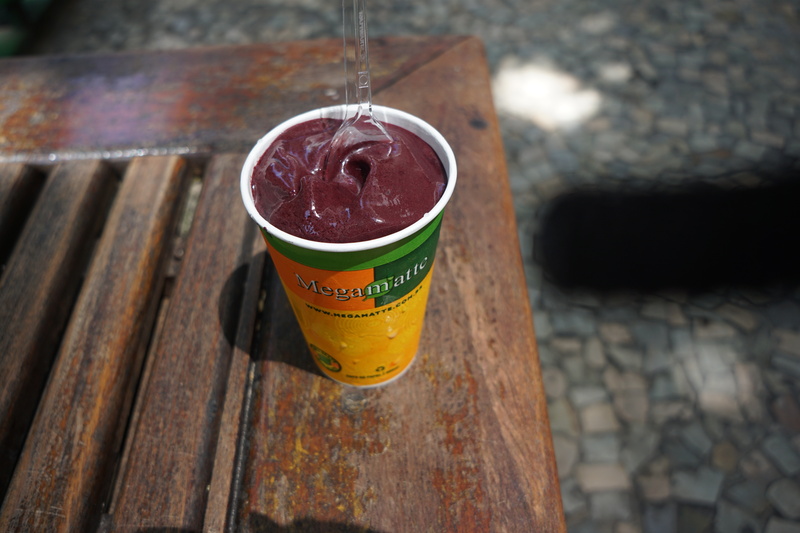 When walking between the two beaches I discovered Megamiatte, which is an absolutely delcious Acai Frozen Yogurt. I only ordered a medium but quickly wished that I had ordered the full size cup. Don’t make the same mistake. 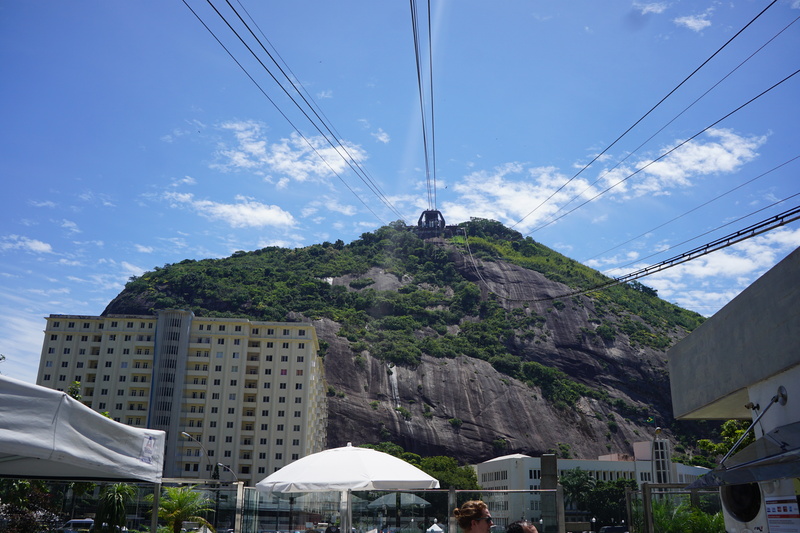 Sugarloaf Mountain is located to the East of Copacabana and offers amazing views of both Copacabana and Rio de Janeiro. There’s just one catch, you have to take cable cars to the top of the mountain. As you can see, there are two cable cars that go between the ground station and the top of the first mountain. 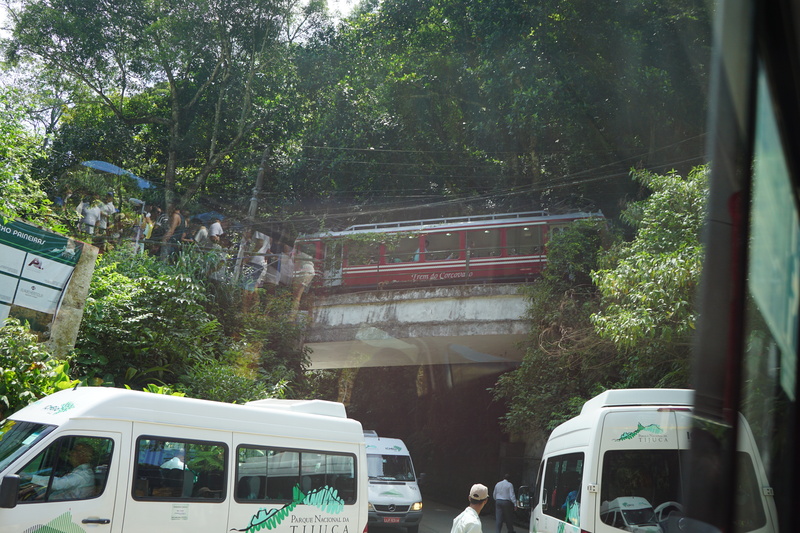 There is a second set of cable cars that go from the top of the first mountain to the top of the second. The cars are surprisingly large and fit more people than you’d expect. The view from the top of the first mountain is amazing. You can see Cristo Redentor in the middle of the photo. You can see Copacabana to the left of me. The weather was perfect for a trip to the top of Sugarloaf. Here is the North view from Sugarloaf, you can see the local airport and part of Rio de Janeiro. The local airport was awesome! I already posted about how cool it was to watch the local planes land because they needed to make a >90 degree turn. 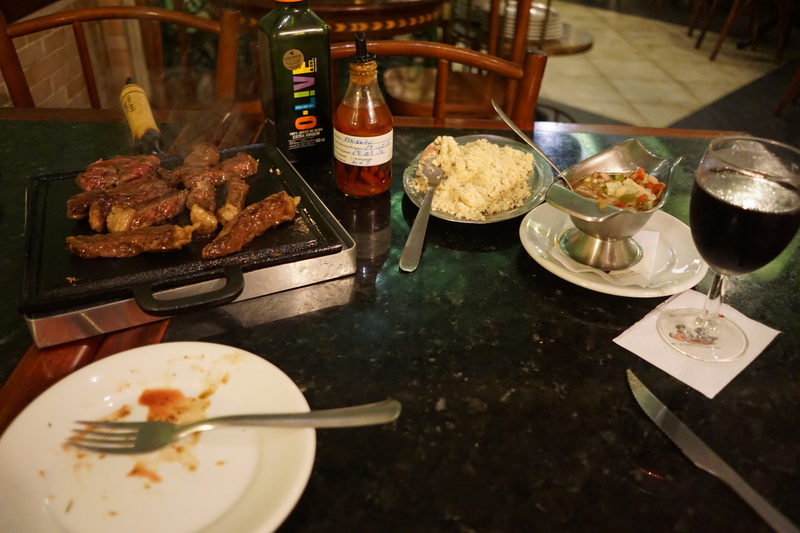 I wanted to try Brazilian steak during my trip which was easy to find because most restaurants near the beach served either steaks or empanadas. I ordered my steak and a local Brazilian wine. Within five minutes of ordering, the steak came out. I was impressed, now that was service! Fortunately I noticed the problem rather quickly. The steak was almost rare but the pan was still pretty hot. I cut the steak into thin strips and continued to cook it on the plate until it was cooked medium well. It was delicious but my poor waiter was confused. On my last day, after I checked out from the hotel, I wanted to hang out by the beach before my red-eye flight back to Washington DC. 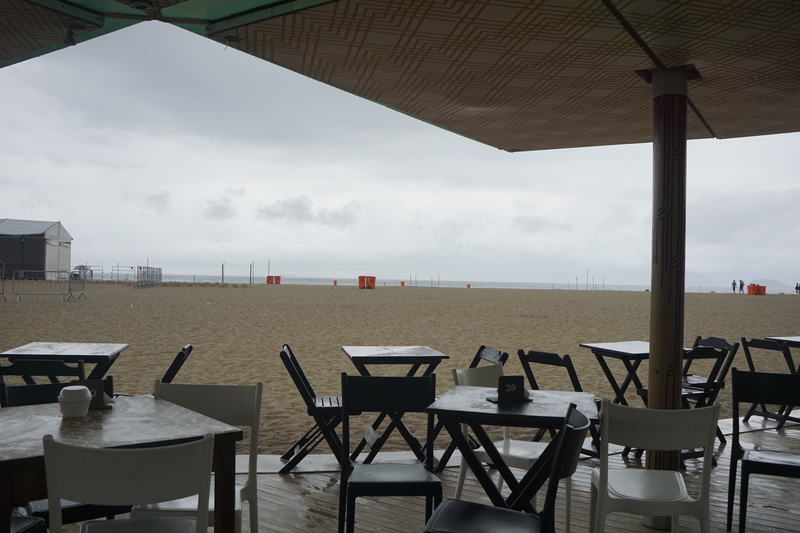 Since it was raining, I grabbed a table under an umbrella and ordered a few caipirinhas (similar to a mojoito but with more lime and less mint). This section is necessary to explain an important lesson that I learned while in Rio de Janeiro. Very few people spoke English which was pretty cool. I used hand gestures to communicate with folks until I needed to use the bathroom on the last day. Realizing that there were no hand gestures appropriate for a cafe, I asked for the “bano” (Spanish for bathroom). Magically the lady understood me! Even though Brazilians speak Portuguese, most people understand Spanish. If I had discovered this sooner, I could have forewent the hand gesture method of communication. Other than the lady at the front desk of my hotel, the only other people who I met that could speak English were trying to direct me toward “ladies of the night.” True quote. Still not interested. This problem recurred every night. 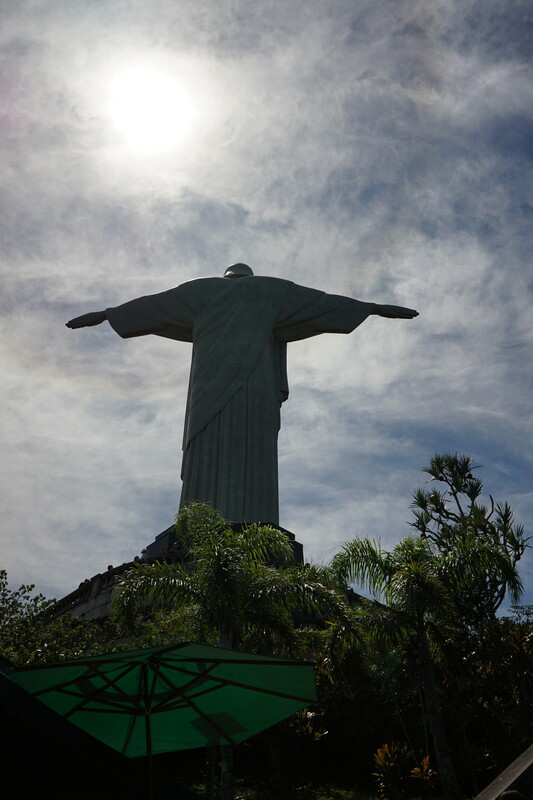 Overall, Rio de Janeiro is a great city to visit with a broad range of outdoor activities–beaches, mountains, cable cars. Everything was cheap due to the favorable exchange rate. Thankfully I saw no mosquitoes so the Zika virus was not a concern. 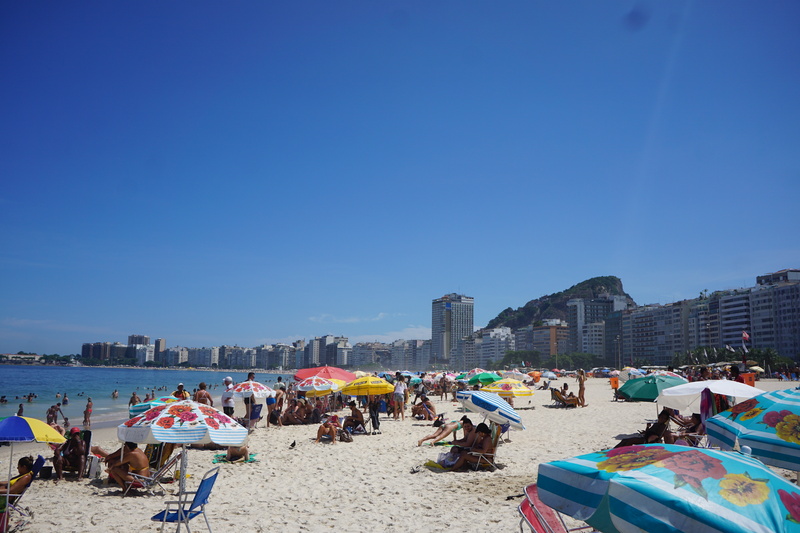 Be the first to comment on "Copacabana Beach (Rio de Janeiro, Brazil)"